News came down yesterday the excellent blog exchange service, BlogExplosion is up for sale and with that announcement, the blogging world implodes to never be the same again. I wish Thomas and Jeff well. I miss them already. A sad day in blogland, David. I found you via BlogExplosion. I don’t know how else I would have found this site. Yes, it is a sad day in blogland. BlogExplosion will be hard to replace. Now I will have to be extra sure to visit you more often instead of relying on a blog exchange to find you. This BlogExplosion Implosion might make us more aware of staying directly in touch with each other now. That’s big news! The best blog exchange on the net, after a lot of recent development, has suddenly had the wind taken from its sails. I’m not sure what will happen in the future. I hope it will continue to thrive because it’s a great source of new blogs for me to surf and it helps establish links to similar content, etc. Yeah, it is big, depressing, stinky news! I find it hard to believe the new conglomerate owner will have the gumption and innovation to keep the service alive and swift and kicking. BlogExplosion will likely be suspended in its current amber and the rest of us will mourn the good ‘ole days when every week brought a new delight. Will miss Thomas and Jeff. Wish them best. You are quite kind, tajuki and I’m sure Thomas and Jeff appreciate your support. They build a good thing. Maybe they build good again. You make a fine point, tajuki. Maybe Jeff and Thomas will go out and build the next big blogging thang! I just read that on their site, I hope they do well out of the sale. Hopefully new owners will not try and recoup the sales price by trying to charge membership fees. We’ll see. Been looking at Blogmad which is still in Beta and be interesting if this service becomes as widely used as BE is. I think monthly membership fees would certainly be a necessary part of the new BE owner’s plan in order to guarantee a level of predictable income from members. Thanks for letting me know you found us here via BE. That’s good to know! We are always happy to supply you with all your shaving needs. Blogmad might be good. Paul, one of our commenters here, is heading up Blogmad — he’s had a lot of success on the web by building sites and selling them so I anticipate Blogmad to be really good for awhile as membership grows and then, it too, will implode just like BE in a subsequent sale to another mega-company looking to expand their venture capital portfolio while the rest of us suffer for the sales effort. Perhaps we should get a group of people who are active here and try to buy it from the pair. Perhaps we couldn’t produce the same type of money they might get somewhere else, but it might be worth it to keep their vision alive. I’m in! Welcome to the blog and I love your idea! I wonder how many millions we’d have to raise to convince them to hand over the entire BE kaboodle? Thomas and Jeff – great. Maybe a bit sad to see BE go – happy to think she might not be in a job anymore. Welcome to this blog and I thank you for your comment about Thomas and Jeff. Who is Rachel? Is she a third owner of BlogExplosion? Jeff doesn’t like me much, understandibly (we had a bit of a falling out when he banned me :P). Currently, I’m a moderator at BlogMad. If you need an invite, contact me. What happened that caused you to be banned from BE? Paul sent me a Blogmad invite but I haven’t had time to get in there and get my account set up. What are the differences between Blogmad and BE? Hell yeah David! BlogMad has a surf ratio of 1:1 (so for each blog you vist, you get 1 hit. On BE, you need to visit 2 blogs to get a hit). Also, there’s much more games and much more Ajax. I was banned following a long series of disputes. Sounds good to me! I guess I better go login to Blogmad again and see what’s up! I’m sorry you had trouble at BE. That doesn’t help anyone on either side. 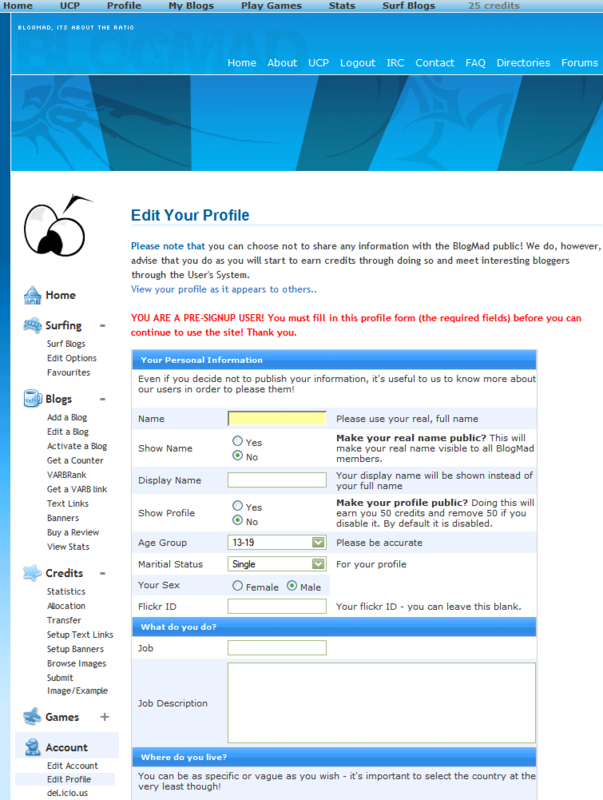 I tried to get past the signup sheet for Blogmad where you enter your name and info and picture and I submit it only to be told it was never submitted. Help! I don’t understand you David. Screenshot? I fill in everything on that page and SUBMIT but my info never gets accepted. I keep getting sent back to that screen with the awful red text. If I may correct that. We are not in this to sell out. Okay, I stand corrected and thanks for setting the record straight. I remember or conversation differently but I defer to your current comment. Now you guys need to fix your signup process so those who want to get in can get in! You have seen what we have accomplished with BE and our dedication to making BE a great site for bloggers. But.. You know when it’s time to go. We have done everything I think possible to take BE to the best place we could and proud of what we have accomplished. I think we are tired out, I think the batteries are dead here and we need new challenges to keep us motivated. Is there anything wrong with that? Selling out? I don’t think so and I resent the implications Paul.. Do you guys scour the net and comment whenever BE is mentioned? Seems like it.. I think BlogMad has a bunch of issues that need to be addressed rather than looking around the net and badmouthing our site (while chatting up BM at the same time.) I call that spamming if you ask my definition of spamming.. I could explain how easy your surfbar is to cheat with a simple emulator program, but you will find that out soon enough — Or your members will… Paul you will do well concentrating on BM right now. Joe the reason you were banned was because of just that. Heck Joe I still have to delete your comments on our blog. Just like finding this post you continue to essentially spam blogs out there. Thank-you David for always being such a fantastic member. I have always enjoyed your blog and it was people like you who made it all the worthwhile. Aw, gee! I had no idea there was so much going on behind the scenes in the blog promotion game! What an education you gave me! There is no doubt BlogExplosion is a historic idea and I have always loved your design taste. Your site is beautiful to experience. There’s nothing wrong with moving on — we’re just expressing feelings of abandonment and wanting, that’s all! Thanks for the kind words, Jeff, you guys have always been good and responsive to me and I wish you both all the best as you move forward and I’m sure all the hard feelings that were created in this blog exchange wake will one day subside and everyone will look back on this time as a golden moment in their lives when every opportunity meant happiness and hope for the future.